Requires 12x12 mat & paper. 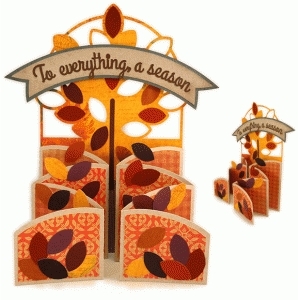 Tall card features oval-leaves tree in arch back panel, with double cascade side panels that wrap to attach at back side with flanges. Measures approx. 9" tall x 5.5" wide when folded. Use favorite autumn colors for the dozens of leaves that remain on the tree (along with cut-outs to whimsically show where others have fallen away), a few on each level of the cascade, and "piles" at the front bottom panels. File includes accent shapes to decorate the front-viewed panels, and optional template to assist with on-tree leaf placement. A SnapDragon Snippets design.